Creating spider chart with free templates and examples. Spider chart has never been easier. 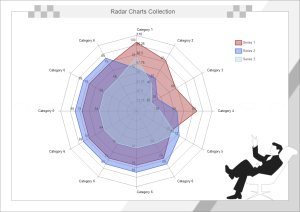 Spider or radar chart, also called polar chart, spider chart, web chart, star chart and star plot because of its appearance, displays multivariate data in the form of a two-dimensional chart of more than three variables represented on axes starting from the same point. 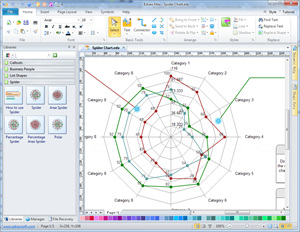 Spider or radar charts are designed to plot one or more series of values over multiple common quantitative variables by providing an axis for each variable, arranged radially as equi-angular spokes, called radii, around a central point, which gives the plot a star-like appearance and the origin of the name of this plot. 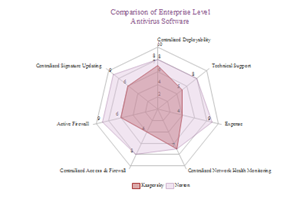 Spider or radar charts are a useful way to look at several different factors all related to one item. Spider diagram templates provide you lots of special spider shapes, spider, area spider, percentage spider, percentage area spider, polar. All the shapes will be good assistants for you when you draw the spider diagrams. 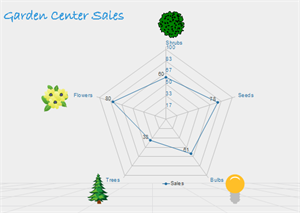 This spider chart can be used to compare sales data of different items of one shop. 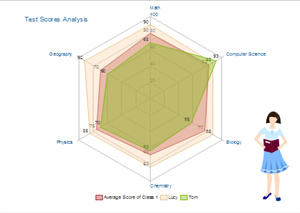 This spider chart analyze several students' scores clearly in terms of different subjects. See how spider chart can be used for effective data analysis. 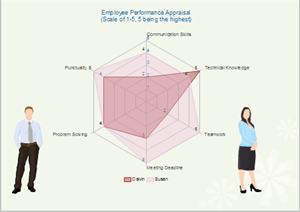 This spider chart template can be used to compare 2 employees' performance from the perspective of communication skills, technical knowledge, teamwork, meeting dealine, problem solving and punctuality. 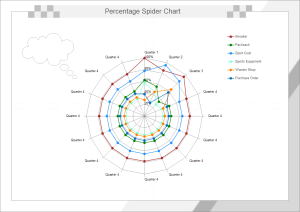 This spider chart example is suitable for comparing two series of data from 7 perspectives.